It has been said that if Hong Kong people have a defining ideology, it is the rule of law. It is no surprise then that the rule of law has been the focus of considerable public debate and comment in 1998/99. Indeed, this was also the case in 1997/98. Hong Kong people place the utmost importance on, and trust in, the continued development of the common law system, the independence of the judiciary and the right to a fair hearing. Added to this equation since reunification has been the Basic Law, Hong Kong's constitutional document. Court cases which have dealt with the implementation and interpretation of the Basic Law have been the focus of intense public debate and scrutiny over the past two years. This in itself is to be expected given the new constitutional order that promises Hong Kong a high degree of autonomy under the unique concept of 'One Country, Two Systems'. 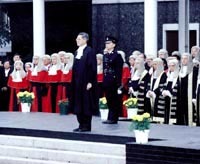 Hong Kong's first real constitutional test case related to the Court of Final Appeal (CFA) judgment on January 29, 1999, on who is eligible to live permanently in Hong Kong following reunification on July 1, 1997. The case was brought by a group of Mainland people who claimed the right of abode, or permanent residency, under Article 24 of the Basic Law. Article 24 lists the people entitled to the right of abode, by birth or residency, to live in the HKSAR after July 1, 1997. In this case it related specifically to Chinese citizens born outside Hong Kong. A government survey estimated that up to 700 000 people living in the Mainland would be newly-eligible for right of abode in Hong Kong immediately as a result of the CFA ruling and that almost another one million would become eligible when the first generation of 700 000 had been a resident for seven years. The cost of providing the extra land, transport facilities, housing, hospitals and schools to cope with such an influx is estimated at HK$710 billion (US$91 billion) over the next decade - which would easily account for Hong Kong's foreign currency holdings of about US$90 billion - the world's fifth largest. Most significantly, more than 6 000 hectares of new land would be needed - the equivalent of about 30 years' normal land production. On May 18, the HKSARG announced it would seek a legal and constitutional remedy to the problem. That is, to seek an interpretation of the Basic Law in regards to who is eligible to settle in Hong Kong by claiming the right of abode, or permanent residency. When immigration legislation was enacted in 1997, the history of the relevant articles in the Basic Law was carefully studied and it was understood that the legislation was consistent with those articles. In light of this background, the HKSARG considered there were good legal grounds for seeking a definitive interpretation of those articles from the Standing Committee of the National People's Congress under Article 158 of the Basic Law. The HKSARG contends that the right of abode can be claimed only by children, one of whose parents was a permanent resident at the time of their birth. If the 'time of birth' criterion is used - as it was before the CFA interpretation - the number of immediately eligible migrants would be reduced to about 200 000. Even so, this is still the equivalent of almost four years' normal immigration from the Mainland. It is important to note that the HKSARG sought an interpretation of the Basic Law, not an appeal against the CFA judgments - two completely different things. Interpretation is not an attempt to overrule, or reinterpret, the CFA judgments, which the HKSARG respects. The litigants who won their court case against the government on January 29, 1999, will be able to keep their right of abode. There has not been - nor will there be - any attempt to overturn the judgments as they apply to the Mainland people who brought their case before the CFA. Those judgments will stand, regardless of any interpretation by the Standing Committee of the National People's Congress. A review of the CFA's judgments in the cases that were decided is legally impossible, and was not considered. But future claims for right of abode must not necessarily be determined in accordance with the current CFA judgments. As in any common law jurisdiction, the usual way in which to deal with such a quandary, or a legal loophole, is to amend the law. But Hong Kong could not act alone to change the law in this case because it is a constitutional matter. Under the Basic Law, which was promulgated in 1990, the power to amend or interpret Hong Kong's constitution is vested with the national legislature, not the Hong Kong legislature. The Basic Law includes very clear legal powers in respect of who can interpret or amend it. The power of final interpretation lies with the Standing Committee of the National People's Congress. The power of amendment lies with the National People's Congress. The CFA has itself expressly acknowledged this power of interpretation. Any interpretation can not diminish the status of the CFA. It simply reflects the respective roles given to the CFA and the Standing Committee as clearly spelt out in the Basic Law. Similarly, it can not be argued that an interpretation would deprive Hong Kong of any legal powers - Hong Kong does not have the power of final interpretation or amendment. An interpretation would not undermine judicial independence. Judges decide cases in accordance with the law. If the law changes, or if there is an authoritative statement on the law, judges are duty-bound to decide cases on this basis. Interpretation is not a solution imposed on Hong Kong by Mainland authorities - on many occasions the leadership in Beijing has stressed its preference for the matter to be resolved in Hong Kong, by Hong Kong people. However, a solution to the problem is beyond Hong Kong's legal powers, and that is why an interpretation was sought. The move had the overwhelming support of the community and a clear majority of Hong Kong's legislature. Two high profile 'cross-boundary' criminal cases led to considerable public debate over the respective jurisdictions of Hong Kong and Mainland courts. One case concerned Cheung Tze-keung, known as 'Big Spender' Cheung, and his gang. The other involved Mainland resident Li Yu-hui who had murdered five women by poisoning them in a Hong Kong apartment. Both men were arrested in the Mainland, tried by Mainland courts and eventually executed for their crimes. Hong Kong does not have the death penalty. The cases raised the concern that Hong Kong's jurisdiction over offences committed in Hong Kong had been eroded. Some expressed worries that Hong Kong residents might be tried in the Mainland for offences committed in Hong Kong, or for acts that constitute offences in the Mainland but are not unlawful in Hong Kong. Cheung Tze-keung and others were tried in the Mainland for a number of serious offences committed there, including illegally procuring and smuggling firearms and explosives, and the planning of kidnappings. Under the Chinese Criminal Code, the Mainland courts have jurisdiction over these offences. Whilst the Hong Kong courts would have jurisdiction over alleged offences committed in Hong Kong, subject to sufficient evidence, it is normal practice for the place where the arrests occurred to have first call to exercise its jurisdiction. Cheung and his gang were arrested in the Mainland, which exercised jurisdiction over their cases on the basis that the offences either took place or were planned in the Mainland, and not because Hong Kong is part of the PRC. Although the murders of the five women were committed in Hong Kong at a housing estate named Telford Gardens, Li Yu-hui was a Mainland resident and was arrested in the Mainland. The Chinese Criminal Code gives the Mainland courts extra-territorial jurisdiction over crimes committed by Chinese nationals who are Mainland residents. Hong Kong courts also have jurisdiction over the case. Had Li been arrested in Hong Kong, and had there been sufficient evidence, he would have been charged and tried in Hong Kong. However, in the absence of a formal rendition arrangement between Hong Kong and the Mainland, there was no legal basis to seek his return to face trial in Hong Kong. Concurrent jurisdiction is not uncommon in criminal law. It is quite possible for foreign courts, including those of the USA, to have extra-territorial jurisdiction over offences committed in Hong Kong. Both before and after reunification, there have been instances in which both Hong Kong and another country had jurisdiction over the same criminal act committed in Hong Kong, but the cases were tried elsewhere. In both the Cheung and Li cases, the accused fled to the Mainland before they could be apprehended in Hong Kong and the Mainland courts exercised jurisdiction in accordance with relevant provisions of the Chinese Criminal Code. The Mainland did not interfere with Hong Kong's jurisdiction. Nor was the independence of Hong Kong's judicial system eroded. There is no reason to fear that the Mainland will normally seek to exercise extra-territorial jurisdiction over Hong Kong residents who commit offences in Hong Kong. Article 19 of the Basic Law gives the courts of Hong Kong jurisdiction over all cases in the HKSAR. Mainland courts have no jurisdiction over offences committed solely in Hong Kong by Hong Kong residents. These cases do, however, illustrate the value of putting in place a formal rendition arrangement with the Mainland. Discussions have already been started with the Mainland authorities on detailed arrangements for the surrender of fugitive offenders between Hong Kong and the Mainland. This is proceeding carefully, given the differences between the legal and judicial systems in the Mainland and Hong Kong. It must be remembered, in particular, that there is capital punishment in the Mainland, but not in Hong Kong. 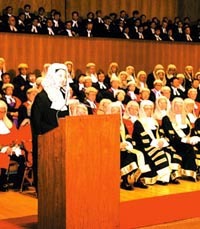 The Hongkong Standard (Sally Aw) case brought into focus the prosecution policy of the Department of Justice. Two serving senior executives and one former senior executive were charged by the ICAC on March 17, 1998, with conspiracy to defraud advertising clients by inflating the circulation figures of the Hongkong Standard and Sunday Standard. The papers' proprietor, Ms Sally Aw, was named as a co-conspirator but was not charged. The case was heard from November 23, 1998, to January 20, 1999. The three accused were found guilty and sentenced to four to six months' imprisonment. As promised in 1998, the Secretary for Justice delivered a public statement after the case was heard on why Ms Aw was not charged. On February 4, 1999, the Secretary told the Legislative Council Panel on Administration of Justice and Legal Services that in deciding not to prosecute, she had first concluded there was no reasonable prospect of convicting Ms Aw on the strength of available evidence. Public interest grounds had also been taken into consideration following representations about the Sing Tao group, which publishes the two newspapers, by counsel for Ms Aw. The Secretary stressed that the Department of Justice controlled prosecutions free from interference and that well-established principles as set out in the published Prosecution Guidelines of the Department of Justice were scrupulously followed in the Hongkong Standard case. She said the personal connections or political status of any suspect did not feature in the decision not to prosecute Ms Aw. The reason for not prosecuting Ms Aw was insufficient evidence. That ground alone sufficed to dispose of the matter. The Director of Public Prosecutions' research on 11 leading common law and civil law jurisdictions has established that prosecution agencies in other jurisdictions may take similar public interest factors into account when deciding whether or not to prosecute. Following the Secretary's explanation, Legislative Council Member Margaret Ng, who represents the legal constituency, alleged that the Secretary's interpretation of public interest was fundamentally wrong. She moved a motion of no confidence in the Secretary for Justice on March 10, 1999. The motion was defeated.